Have you ever thought why cocktails become especially delicious when prepared in certain proportions? You must have also come across a case when such proportions were disturbed, and the result deceived your expectations. You guess right - it’s all about balance. It’s exactly the balance that makes a cocktail so peculiar. That’s why there are recipes, and there are people who invent them. This is a real science, and there’s a word for it – mixology. In Shishka Lounges mixology is felt in every aspect – be it hookah or cocktail mixes, food or interior, and even the atmosphere. Each of the two hookah lounges is unique in its own way, but the basic concept remains – that is to share the best with each customer who is treated as a friend, and friends deserve the best. Rich choice of base materials, over 200 house special mixes, newest equipment along with individual approach provide the supreme flavour of each bowl. The menu contains Asian, American and European food always reshaped under the personal touch of the chefs. Chicken breast and blanched vegetables, rolls with king shrimps seasoned with truffle oil, button mushroom cappuccino or lemon mousse with basil leaf – any dish in the menu can make the visitors long for more. Created by masters of mixology, cocktails are really out of this world. The tea list is no less impressive boasting great choice of elite and collection teas. Strive for balance is also seen in the interior. 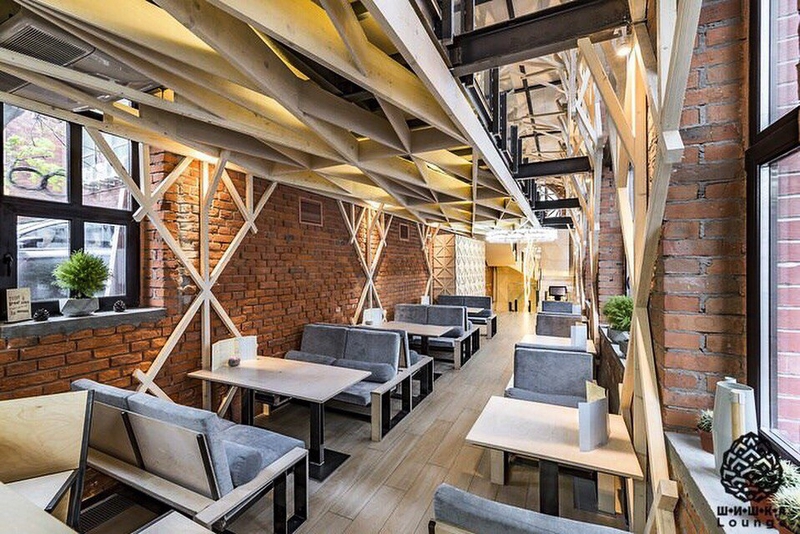 Shishka Lounge Krasniye Vorota is built in a new format with no typical Arabic theme involved. This is a very light, airy space designed in brick, concrete, glass and wood. The catch is in an unusual geometry which made the bar famous. Vaulted ceiling, complex glass, brick and wood constructions help the guests immerse into the state of freedom and calm. There are three floors with two bars and a VIP room. In summer, a terrace is also open for up to 50 persons. Shishka Lounges offer a large collection of table games including monopoly, chess, etc. Another ingredient to make the guests’ pastime even more enjoyable is live music and DJ-sets. Themed nights, interactive programs and sport broadcasts add to entertainment. Shishka Lounges also offer Shishka Family benefits - a discount-bonus scheme to make the regular customer’s life even more pleasant and easy. So, if the rapid-fire pace of the big city makes your feelings mixed, visiting Shishka Lounges is a nice chance to re-mix them and restore the balance.